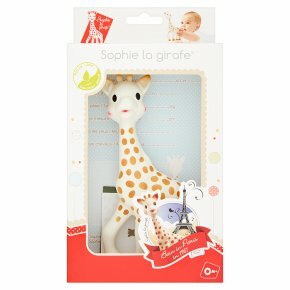 Sophie' the giraffe, made from 100% natural rubber derived from the sap of the Hevea tree, has been part of babies' lives for over 50 years. Slender, flexible, and soft, babies can squeeze and chew her in complete safety. Lovable and amusing, she laughs when her body is squeezed. Stimulating to baby’s senses with her soft colours & gentle squeak. Sophie's bumpy head helps soothe sore, teething gums.